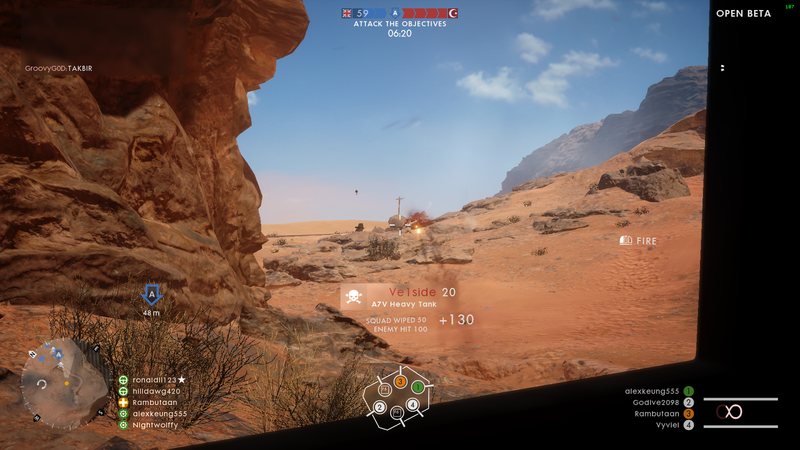 Several days ago saw the end of the Battlefield 1 Beta but before it ended, I managed to get in a few rounds of Conquest and Rush on the one map they offered: Sinai Desert. The last time I've played a Battlefield game was several months ago when I was still playing Battlefield 4. Since then, my FPS of choice has been Rainbow Six Siege which is quite a bit different in terms of pacing and strategy. So I haven't had the opportunity to play the two spin-off titles Battlefield Hardline or Star Wars: Battlefront in the meantime which means when I make comparisons, I'm going to be making comparisons with the main series. So what has changed since Battlefield 4? Now since the last Battlefield game I've played is Battlefield 4, I've never come across this concept of "elite classes" before. Apparently, it's a similar concept to Battlefront's Heroes and Villains or similar to the weapons you can pick up on the map in Battlefield 4 such as the railgun. In the beta there were three elite classes: the Sentry who is a guy with a large machine gun and platemail, the Tank Hunter who can deploy an anti-tank rifle, and the Flame Trooper who likes to dance to Disco Inferno. The tickets system has now changed for Conquest (but IIRC, it hasn't for Rush). Basically, in previous iterations of Battlefield both teams would start with an equal number of tickets and by either capturing points or killing the enemy, you would cause the opposition to "bleed" tickets. The first team to have 0 tickets is the loser and the one still with tickets remaining, the winner. In BF1, both teams start with 0 tickets and then must be the first to reach a certain number of tickets. So instead of losing tickets you now have to gain tickets. Also, the gaining of tickets is only influenced by the capturing of objectives instead of kills. The move has been controversial amongst veterans of the series but changing the game so that PTFO has a greater impact on winning or losing surely can't be a bad thing. There aren't any engineers in the game anymore, but you do have the "driver" or "pilot" as a class now. Basically, when you spawn in a vehicle or plane you're assigned to the Driver/Pilot class. You only get a basic weapon (in the beta it was a Mauser C96) but as it was with the engineer class in BF4, you can repair vehicles - you can even do so from inside the vehicle, although any hits to the vehicle will result in the repairs being interrupted. The Assault class is the new Anti-Tank/Close-quarters class as they're able to equip a Sub-Machine Gun and they also carry anti-tank grenades. 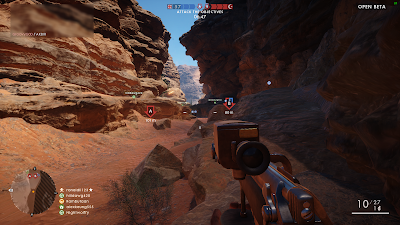 Scouts are the snipers of Battlefield 1 but they also have the ability to use armour penetrating "K bullets" which does slight damage to vehicles. Medics and Support are the only two classes that are pretty much the same as before. BF1 has decided to use the old Royal Navy military alphabet so you have points such as "Apples", "Butter", "Charlie", "Duff", "Edward" etc. Audio has always been one of the strengths of the Battlefield series and BF1 is no different. I especially enjoy the sound of the planes as they make strafing/bombing runs :). For those that hate matchmaking, rejoice, since the game is going to have a server browser. For those that hated Battlelog, you get an added bonus because this server browser is an in-game one. Downed players that need to be revived no longer show up on your HUD by default, unless the downed player actually wants to be revived. When you've been incapacitated by another player, you have the choice of not calling a medic and skipping back to the respawn screen, or requesting for a medic and hoping one can get to you on time. On the death screen you're actually able to tell if medics are a few metres away or not so you can gauge whether it's likely a medic will get to you in time or not. Neat! Ahhhh those WWI aircraft. Propeller planes are back! Not only does this mean your mates can help you out by playing as gunners but due to their slow speed and vulnerability to small arms fire, planes aren't as powerful as they are in the modern era Battlefield games. There are now horses you can ride on in Battlefield! When you ride them you can either fire a rifle or use a sword to slice and dice your enemies. They also can drop ammo and health kits. What I love best about them though are the commands you'll utter; you'll even warn the horse before you're about to jump over an obstacle! Now that's some attention to detail. It remains to be seen if these things become OP though since there have been some videos surfacing of people just dominating with these things (although I tend to have a habit of either missing my targets altogether or being shot off as soon as I'm in range). While you're not going to escape Sub-Machine Guns and Machine Guns, two classes, the Medic and Scout, get a whole bunch of bolt-action rifles to choose from - and there's something just satisfying about playing a shooter in this era. 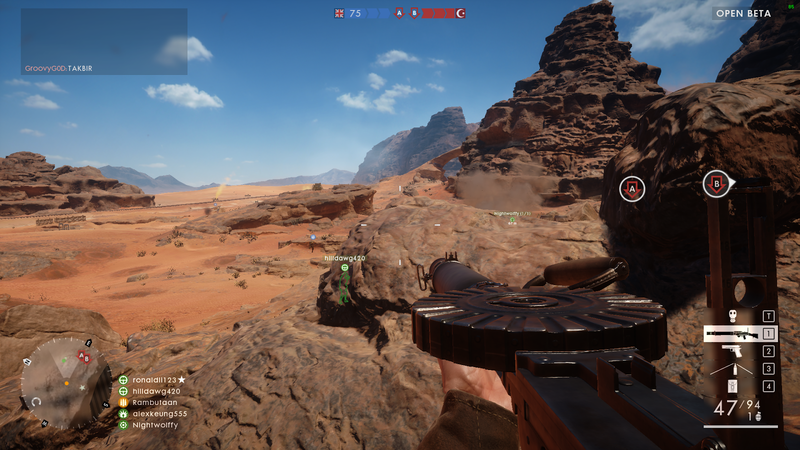 We didn't get a chance to test the zeppelin in the beta but there was an armoured train which is one of the super vehicles that can spawn on each Conquest map, apparently to help the losing team get back into the game. Unlike other games that tend to reward those dominating on a map with even more powerful abilities *cough* COD *cough* I think it's great that these super vehicles have been introduced as a gameplay mechanic as it means the winning team have to work extra hard for a victory. In fact, players who elect to play as drivers in this game are quite limited in what they can do. Sure, they usually get a metal behemoth of death and they're able to repair the vehicle from inside (provided they're not under enemy fire while doing so) but outside of the vehicle, they're usually only equipped with a Mauser C96 and not much else. For those sick of the wub-wub-wub, scratching and stuttering of the electronica that pervaded the soundtracks of Battlefield 3 and Battlefield 4, then you're in luck because Battlefield 1 returns to the roots of the franchise with an orchestral score. Not only that but, as usual, you'll be able to hear leitmotifs from the original Battlefield sprinkled subtly throughout. I had very little issues while playing the beta. I didn't really notice any rubber banding or graphical issues. Mind you, I had a better experience with the Battlefield 4 beta compared to the actual game for the first few months so the beta running well on my computer isn't really saying much. No longer do you wait at the spawn for vehicles to spawn. Now you pick a vehicle on-demand (provided there are any available at a particular spawn or objective) and you'll instantly spawn in one. This is great because no longer will you have players loitering around the spawn waiting for a plane only for me to take one and then hear them scream "THAT'S MYYYY PLANE COLONEL MUSTARD!!!!!" over the mic. While I've already mentioned this is one of the better aspects of the game, it's also its Achilles heel. That's because when you wait to pick a vehicle, while you might not be waiting at the spawn, you're instead waiting in the spawn screen instead, when you could be out in the field doing something for your team. Also, when you pick a tank for example, you get to decide whether it's a light, medium or heavy tank. Medium and Heavy tanks allow multiple teammates to join you in the vehicle but if you pick a light tank, it only fits one player: you. Consequently, I can see a scenario where all tanks are light tanks which means you end up with hardly any transport vehicles for your team - which is not a good situation if you've got no objectives to spawn from. Not sure if that'll be the case once the game is released proper but just like Battlefield 4, the weapons don't seem to be faction-based; that means you're just as likely to see a British soldier using a Lee-Enfield as you are an Ottoman soldier. The vehicles seem to be the same for each side too, with the medium tank being British but the Heavy Tank being German. In the beta, you could only play with 24 players in Rush mode. It remains to be seen if this change is permanent and whether or not it's a good change - maybe Rush is better if you only have 24 players in it - at least for the maps they have in mind. The new ticket system may reduce the effectiveness of medics and the support class. I mean, they'll always be useful in keeping a squad alive which is important for spawning purposes, but you'll no longer have that metagame where keeping your squadmates alive also means saving tickets. While this is a good thing in one way it also means that the game seems to encourage human wave tactics... which I guess is kind of historically accurate considering this is meant to be WWI right (i.e. masses of men charging over No Man's Land to secure a trench)? Are tanks the new jets? I've seen some complaints from players that tanks are overpowered at the moment. Usually the only way to get rid of them is a concerted effort by the team to spawn Assault soldiers up close and pummel them with anti-tank grenades - that or bring up some tanks of your own - which to me sounds like jets all over again; i.e. the only way to get rid of jets is to have your own jets taking them down since there's usually no better way to do it (i.e. AA are vulnerable to tanks and infantry don't have the fire rate or range on their own). I'm not sure if this is a good or bad thing but I guess we'll find out whether they nerf the tanks or not when the game is released next month. After playing Rainbow Six Siege for the past few months, returning to a Battlefield game made the whole experience seem very casual and non-consequential - as if what you did didn't really matter. 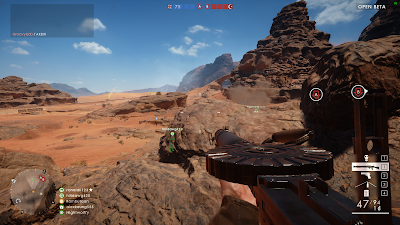 So it took a few tries before I eventually warmed to Battlefield 1 and realised, it's always been like that but what really makes the game fun are the moments when you play with a competent squad and gradually turn the tide of battle through sheer determination and teamwork: that you can still experience in Battlefield 1 which means this game will still be worth a look when it's released next month. 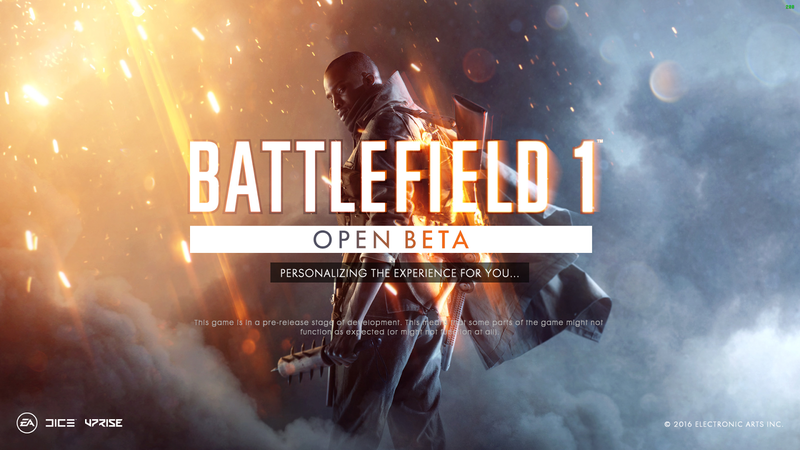 Have any of you played the Battlefield 1 Beta? What did you think? Have you already pre-ordered the game or are you still skeptical?